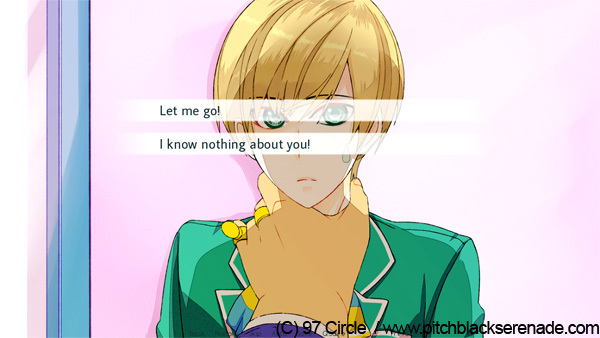 High School scene's early screenshots. If you remember my post about the partitions of the demo, the High School scene is the third one in order and part of the "Choumugai sub-arc". As said before, scenes from the same sub-arc aren't necessarily set in the same place even when the name of the sub-arc refers to a specific location. 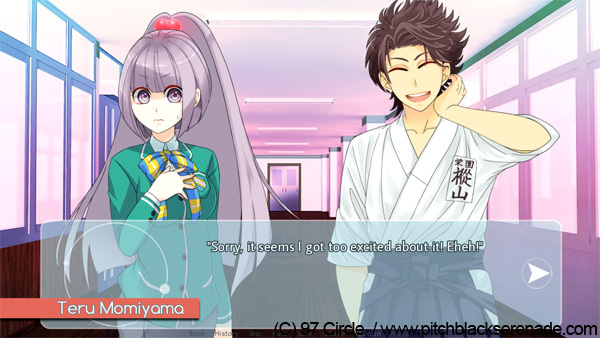 As in this case, the High School scene is just the "second chapter" of a story concerning the Choumugai location. Another peculiarity of this scene is that it's the only one set in Kairi's high school from the time he moves in Kujikawa. Originally, when I first drew the concept art for Kairi, I had the green uniform in mind. Later on I realized Kairi would have spent very few time if none at all in high school because of the story of PBS. However, I decided to have that uniform as a default clothing piece for the three main characters of Kujikawa anyway to give them some kind of unique look. 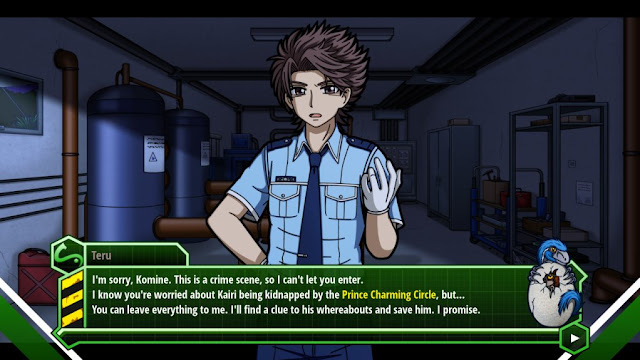 Moreover, that uniform's color and crest have a deep meaning for the investigation segment in Kujikawa so showing it carefully to the players turned out to be of main importance. Enough for the premises, let's overview the scene in question. The High School scene is set in Eizono Private High School (栄園私立学園), located in Educational Hill (学丘), up on the hills of Kujikawa. People from Kujikawa are well known for a high degree of common courtesy and Eizono Gakuen, that covers education from elementary school, is often referred to a place where students are especially kind and polite. With such premise, when a rather aggressive man suddenly breaks into the main hall yelling and cussing, panic happens. The man is drunk and attacks Kairi accusing him of a wrong endured. This CG has been revised to match the new character art and personality of the man "visiting" the school. The goal for the player will be trying to free Kairi from such attack. 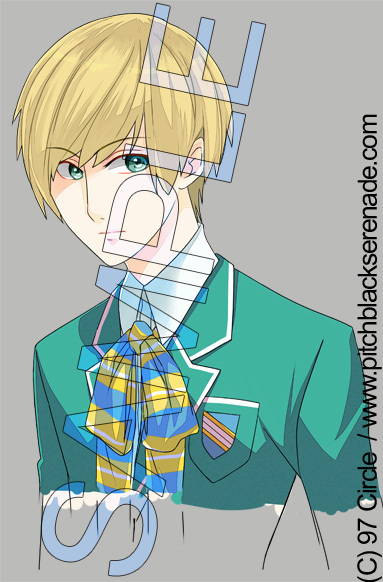 Completed such task, the scene continues with Kairi meeting Fujisa and Teru for the first time. Eizono High's corridor background art was 3D designed and rendered by Livestraes back in 2013. 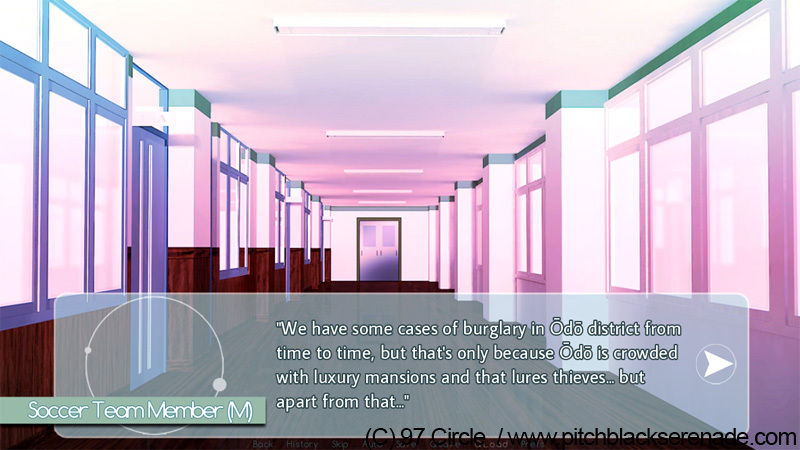 As mentioned before, such scene will introduce the "true" choice system to the player. I'd like to wait for the trailer to be completed before talking about it. However, one things that I can say is that, especially in the beginning, these choices are mainly related to the player's perceptions of what's happening and their knowledge about the story so far. The fact that the demo's scene sequence has a fixed order is purposeful for this mechanism to work. 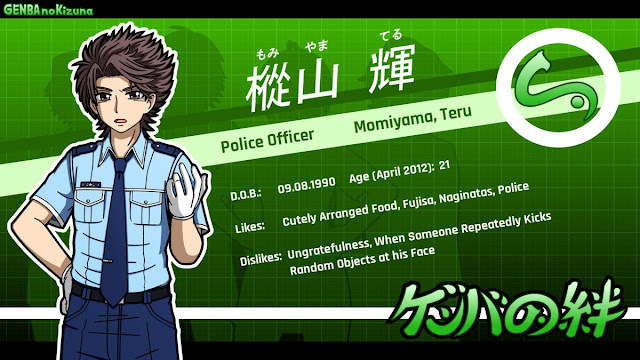 As it will be revealed during Teru's self-introduction in the High School scene, Teru's passion is about police and fighting criminals. For a long time he's been dreaming of pursuing the policeman's career. PBS and GENBA no Kizuna's connections don't end here though. The profile of the main character of GENBA, Keiichi Genba, shares indeed a few information about one of the location of PBS. 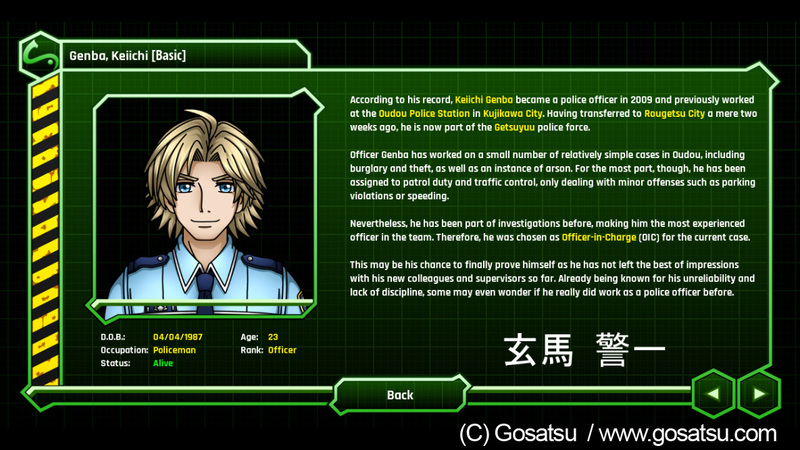 Screenshot from the in-game Character Profiles section in GENBA no Kizuna demo. As Keiichi's profile states, Oudou district in Kujikawa has been prey of a few cases of burglary as well as other crime problems. Since it's the district where rich people live, their luxury mansions often lure thieves. During the High School scene, considering that an aggressive man is threatening students, PBS took the opportunity to talk about this topic as well. Draft for minor characters' dialogues in the High School scene yet to be proofread. Remarking how I feel honored to have PBS featured in GENBA no Kizuna, I'd call it a day for this update! 💥😋 Next week I'm going to refine the High School scene and work on the draft of another one, aiming to be able to show you some more of this game ASAP.